Embroidered & printed golf towels customised with your company logo, golf club or society crest. 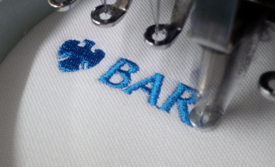 Our prices include embroidering or printing your company logo or business name in one position and are now available to order from 12 with discounts from 25 and over, these start from only £5.89 + vat each plus FREE DELIVERY on orders over £100 to the UK. Buying your Golf Towels embroidered with your company logo could not be easier. Either buy online, call our sales team on 0800 043 1336 or use our online help service by clicking the icon to speak to an advisor. Once your order and logo are received the image processing departments match the Pantone references and set up your digital PDF artwork proof. Once you are happy with how your logo will look on the golf ball we schedule your order for production. Our golf towels are professionally embroidered using the latest technologies resulting in a clear long lasting reproduction of your logo. Spot colour logos are Embroidered with Pantone matched threads or CMYK full colour photo images can create the ideal gifts. All orders are monitored and once shipped are delivered using a tracked courier service ensuring your order arrives on time without delay.